CORONA, CA -- CIRCOR Aerospace Inc., a CIRCOR International company (NYSE: CIR), has been selected by the U.S. Air Force to supply Nose Wheel Steering Actuator spares for the T-38 Talon trainer aircraft with an approximate contract value of $1.5M. 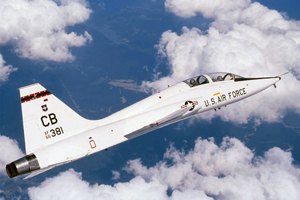 The contract will be administered by the T-38 program office at Hill Air Force Base. This critical landing gear component, based upon CIRCOR’s proprietary design, will be manufactured at the CIRCOR Aerospace facility in Corona, California. Production and testing of first units will commence in early 2011. “The CIRCOR Aerospace team is proud to be a key partner to the U.S. Air Force on the T-38, F-5 and F-16 and are looking to expand our offerings for nose wheel steering actuation to other military and commercial platforms,” said Michael Dill, CIRCOR Aerospace Vice President of Business Development and Strategy.